An outdoor kitchen boosts a home’s value. 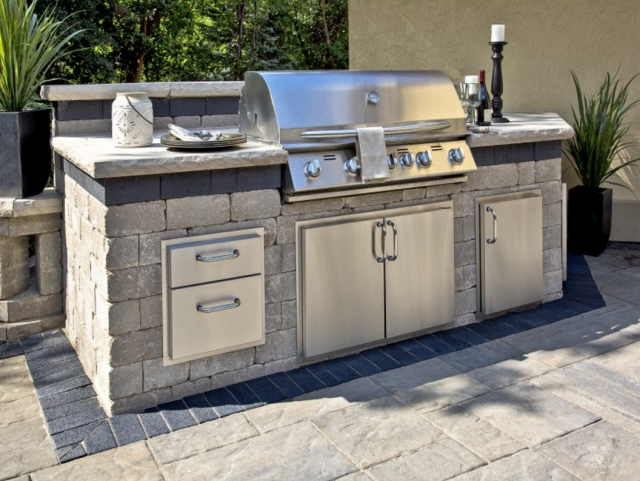 The outdoor kitchen is quickly becoming a growing trend for homeowners that want to maximize their outdoor space while making an investment in their home that would increase their home’s resale value. So consider moving your activities outdoors by creating a space that is perfect for entertaining and cooking. • Having an outdoor kitchen offers homeowners the opportunity to prepare meals while being comfortably surrounded by family members and friends while still enjoying the outdoors. It is a great method for socializing and allows the person inside preparing the meals to not feel left-out while others are outside enjoying each other’s company. • Preparing meals outdoors provides several benefits. It keeps the level of heat within the home at a minimum and makes cleaning up easier. An outdoor kitchen also decreases the traffic within the home during outdoor activities where meals are served. • Most of all, outdoor kitchens are fun. It is enjoyable to be outdoors, to relax in a lounge chair, perhaps to watch somebody else do the cooking. •	Choose low-maintenance materials that are designed to withstand the conditions of the outdoors. Keep in mind that high-quality stainless steel provides a sanitary surface that is both easy to clean and resistant to corrosion. Counters and other materials used for building should be highly resistant to grease stains and able to withstand high temperatures. •	The location of your outdoor kitchen is very important and depends on several factors. The kitchen will need to be oriented in such a way that wind does not blow smoke into the home. However, it would also need to be close enough to the inside kitchen so that you will not need to travel long distances to retrieve items that you need. •	When it comes to outdoor activities the weather can be a big issue. Having a pergola or any other form of covering will allow you to enjoy cooking outdoors, whether rain or shine.